Chief Minister Pema Khandu on Monday flagged-off the Indo-Bhutan Friendship Car Rally 2016, that would cover a distance more than 1000 km and culminate in Bhutan’s capital, Thimpu. 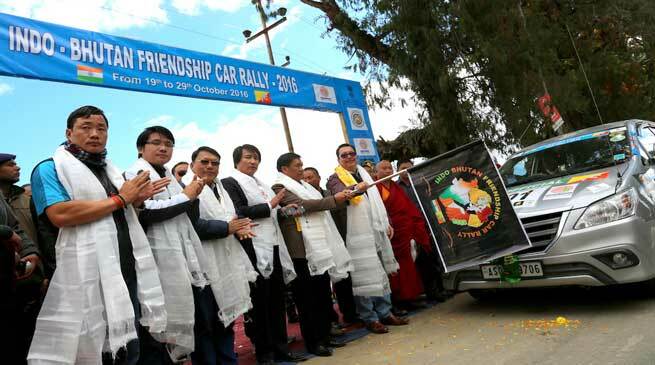 The rally is organized by International Friendship Car Rally Association (IFCRA) and supported by state’s tourism department and Bhutan India Friendship Association (BIFA) to strengthen relations between the two neighbours. The rally with the theme – ‘Reconnect and strengthen the age old historical linkage, cultural and linguistic affinities between Arunachal Pradesh and Bhutan’ is being participated by more than 20 participants from Australia, Portugal, Bhutan and India. The rally is the biggest motor sports event in Eastern India and one of the only three International events being held in Indian sub-continent. Deputy Chief Minister Chowna Mein, Parliamentary Secretary Jambey Tashi, MLAs Tsering Tashi, Dikto Yekar and Olom Panyang including secretary tourism Dr Joram Beda, DC Tawang Sang Phuntsok attended the event.